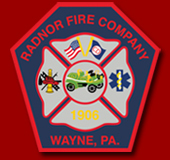 Radnor Fire Company was dispatched to an auto accident with injury and fire on Sproul Road early Saturday morning. At 1:49 a.m., Squad 15 and a crew of firefighters were dispatched to a vehicle collision with possible injuries and vehicle fully involved in fire. Radnor Police arrived first in the 500 block of Sproul Road and reported the occupant(s) were out of the vehicle. Squad 15 arrived with Engine 15 following close behind to supply the Squad with water. The Squad 15 crew pulled the front 150’ 1 3/4" bumper line and quickly extinguished the fire, and performed overhaul of the vehicle. The vehicle was towed from the scene and the incident is under investigation by Radnor Police.